John Machir discussing aspects of affordable housing shortages within the state of West Virginia. 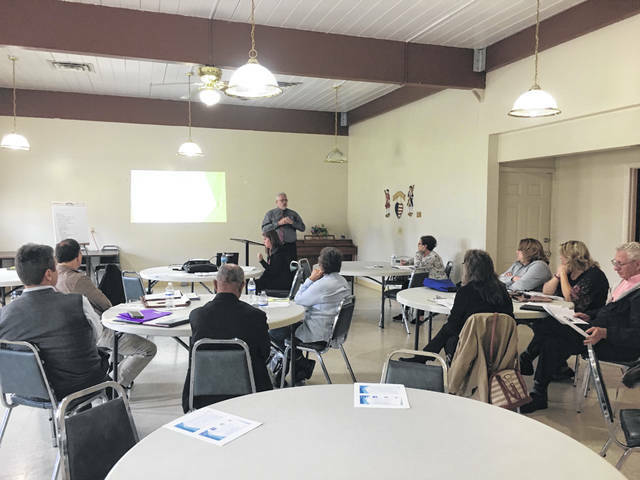 POINT PLEASANT — During a recently held meeting by the Mason County Housing Summit, Mason County Homeless Shelter/ Simms Housing Director John Machir discussed several aspects of housing within the state of West Virginia. Machir discussed statistics of national and state low-income housing within the state, the “Point in Time” count, and what is being done in a West Virginia town to help resolve the shortage of affordable housing and homelessness. According to the National Low Income Housing Coalition, the U.S. has a shortage of 7.4 million affordable rental homes to Extremely Low Income (ELI) households, resulting in 35 affordable and available units for every 100 ELI renter households. In West Virginia, the Fair Market Rent (FMR) for a two-bedroom apartment is $733. In order to afford this level of rent and utilities, without paying more than 30 percent of income on housing, a household must earn $2,445 monthly or $29,336 annually. Assuming an individuals works a 40-hour work week, 52 weeks per year, this level of income translates into an hourly housing wage of $14.10 per hour. In result of affordable housing shortage, some individuals end up homeless. Machir commented on a given night there are 667 homeless individuals within West Virginia. During the last week of January, communities receiving federal funding from the McKinney-Vento Homeless Assistants Grant program conduct a “Point In Time” count of all sheltered / unsheltered homeless individuals residing within a specific geographical area on a given night. Mason County participates in this annual count and by doing so helps the community plan services and programs to address the needs of local residents, measure the progress of decreasing homelessness, and identify strengths and weaknesses in the community’s current homelessness assistance system. A town in West Virginia, Wayne, has taken a step further to combat affordable housing shortages and homelessness by forming the organization Coalfield Development. This organization renovated dilapidated properties into quality affordable housing and had underemployed and unemployed workers hired to construct green, affordable housing. By doing this, the organization created more than 40 on the job training positions as well as more than 200 professional certification opportunities, redeveloped more than 150,000 square feet of dilapidated property, and launched five new businesses in real estate development, construction, wood working, agriculture, and artisan trades.